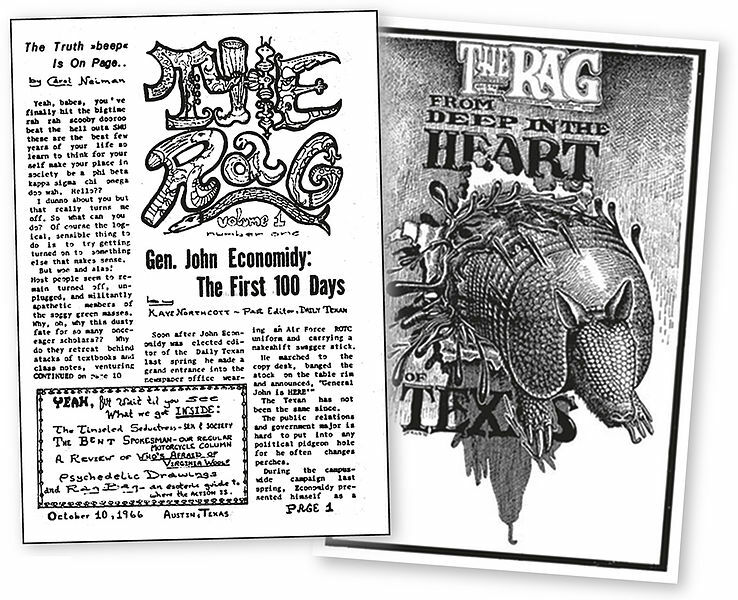 Three hundred issues of The Rag are now available in a digital format. Those of us who came of age in the ’60s remember library research as a visit to “the stacks” or hours spent with spools of microfilm and cantankerous microfilm readers. The Internet has changed all that. Historical documents can now be accessed online through digital archives. The Rag is moving into the new era, thanks to collaboration between a company called Reveal Digital, two donor libraries and nearly 100 funding libraries. 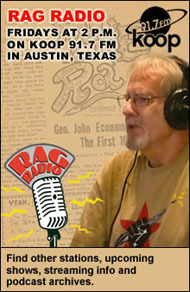 The Rag is moving into the digital era thanks to an innovative collaboration. 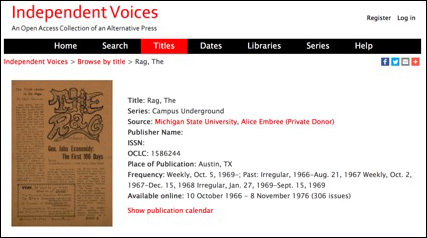 Three hundred issues of The Rag are now available in a digital format, sourced from Michigan State University Library. Reveal Digital hopes to access the remaining 75 issues from The University of Texas at Austin (UT-Austin), with the goal of having the entire 11-year collection available by the time of The Rag’s 50th Reunion and Public Celebration scheduled for October 13-16, 2016. Independent Voices chronicles the transformative decades of the 60s, 70s and 80s through the lens of an independent alternative press. Consolidated for the first time, Independent Voices provides over 1,000 titles from the special collections of dozens of libraries. Independent Voices provides easy access to the powerful voices of feminists, dissident GIs, campus radicals, Native Americans, anti-war activists, Black Power advocates, Latinos, gays, lesbians and more… Access is provided under an open access license. Rights to the individual works that make up this collection remain with the original copyright holders. Over the past two years my colleagues and I have talked to hundreds of librarians about our Independent Voices collection and its place among the many resources libraries provide their communities. They consistently tell us the ability to provide access to a wide range of primary sources is more important than ever because professors are increasingly requiring all students to use and cite primary sources in their research papers. There is also a growing interest in researching topics placed within the mid-to-late 20th century, where a significant gap in resources exists. Independent Voices is beginning to fill that gap, and to fill it in a way that will benefit ALL libraries, not just those who can afford to invest in it. 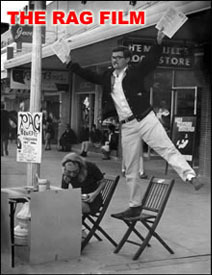 When complete, Independent Voices will provide online access of complete runs of 1,000 alternative press periodicals published primarily between the 1960s and 1980s. Under our open access model libraries that provide funding to pay for the digitization and other support activities receive exclusive access until 2019. Thereafter the complete collection will be available to anyone from anywhere. A few of the titles are open to everyone today, including The Rag. Seventy-eight libraries have provided over one million dollars in funding to date. We still need to raise an additional $700,000 to complete the project as originally conceived. Ken Waschberger, a publisher and Rag Blog contributor, has been a point of contact for Reveal Digital with many of the publications in the Independent Voices collection. 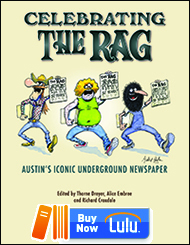 Those of us in Austin preparing for the Rag’s Reunion and Celebration this October, are looking with fresh eyes at The Rag‘s rich history — news covered only in The Rag, iconic art and comics, and priceless photographs. A presentation on the Independent Voices collections is planned for the Rag Reunion. We’re glad The Rag is on the cutting edge of digital access because our collective endeavor will be available to historians and activists for years to come. While The Rag will be an important new digital resource, other types of material from the ’60s and ’70s have left almost no digital imprint. Leaflets, brochures, newsletters, and announcements from actions and organizations are great source material — what librarians and researchers refer to as ephemera. In the last year, I have donated some of my ephemera to the Sara Clark Collection at the Briscoe Center for American History at the University of Texas in Austin, complete with chronologies and lists that librarians appreciate. In a library setting, my files can have prolonged life in acid-free boxes, and they will be searchable through catalogues and on-site requests. Our Austintatious collective past should have a digital presence. These donations may enhance the historical record – and remove several boxes from my home — but I have wanted to do more to ensure that our Austintatious collective past has a digital presence. With this in mind, I started a blog that tells some untold stories taken from documents I have held on to for four decades or more. If you shook a tambourine in a performance of the Women’s Cranky in Austin or heard the Soeur Queens, this blog is for you. If you ate a lunch at Sattva in the Methodist Student Center or a dinner at the Delta Diner, this is for you. If you held a leaflet with the iconic Industrial Workers of the World (IWW) union bug of Red River Women’s Press, this is for you. These blog entries aren’t the full story by any means. They are intended to leave digital markers — breadcrumbs for researchers, millennial metadata — to decades that are largely absent on the Internet. It was a time of great energy and collective optimism. That’s why I call it Collective Impressions. I began this blog after I saw The Tower, the award-winning documentary by Keith Maitand about the Charles Whitman shootings. There is no way to have lived through that day in Austin and not be deeply affected by it. Claire Wilson’s story is central to the movie, but so are two other stories of courage – that of John Fox (now known as Artly Snuff, who helped carry Claire from where she lay bleeding on the main mall, and the “red-haired woman” Rita who comforted Claire during the ordeal. I sat beside Claire Wilson, a Whitman survivor, at the Paramount showing of The Tower at the South by Southwest (SXSW) film festival. I jumped as the noise of the first shot rang out. I shed quiet tears for Claire, but it was Rita Starpattern’s face in the credits that affected me the most. I worked with Rita at Red River Women’s Press. She never talked about that terrible day, August 1, 1966. I heard what she had done from Jeff Jones at the 2005 Rag Reunion nearly ten years after Rita’s death. Claire told me that the young actress who played Rita would like to know more about her. That’s why I started Collective Impressions and began it with an entry about Rita. 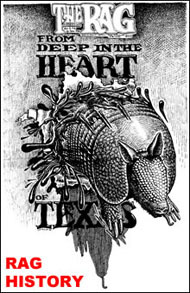 This entry was posted in RagBlog and tagged Alice Embree, Austin History, Collective Impressions, Digitization, Electronic Resources, Independent Voices, Rag Bloggers, Rag Reunion 2016, Reveal Digital, The Rag. Bookmark the permalink. Hello, Alice. It’s good to find you still in the middle of what matters. Yes, I remember Whitman. I left town the previous day for my family’s home in Houston. Watched in horror on our little B&W television the unbelievable slaughter in Austin, my campus and home. When I returned the next day nearly the entire campus area was a crime scene and bloodstains were fresh. The most distant of his victims had been shot a block or so from my apartment. The sorrow, shock and anger were heavy everywhere. So many knew one or more of the wounded and the dead, and there was a community of disbelief and a universally shared exchange of ‘it could have been me / you / a friend’, and ‘I was trapped in / behind a building’, and ‘I watched people fall dead and dying and crying for help’. Some very brave people ran out to give help or pull the wounded to safety, some died helping. I know you know these things, but I was not there to help, was I, and the guilt lives on.